04. Have you ever heard your teacher warm up? My adult workshop at The University of Michigan is called The Anatomy of Sound - A Workshop for Flutists and it happens every year in collaboration with Jerald Schwiebert, Assistant Professor of Theater and Laura Dwyer, Certified Yoga Instructor and professional flutist. Through this class we have been able to help many people to find their distinctive voice on the flute. This class attracts amateurs, students and professional musicians, all in different levels of life and music. After leaving the workshop they all seem to find a deeper meaning in their art because they've let go and heard their own voice in new ways. Students find that they are producing tone by using the body's wisdom, further assisting them in finding their own way in music and in life. I can see now that this pathway is touching hearts. Some students come away using the "Anatomy" and the "Sound" lessons in their daily life, and they are transformed. Healed. Productive. Happy and healthy at the same time! Amy Porter, Professor of Flute at the University of Michigan, presents the ‘Anatomy of Sound’ workshops every year, and this very enjoyable two-disc DVD set is a product of these workshops. The title may suggest that it is a tone focus DVD but, in fact, it covers all aspects of flute technique. Amy and her colleagues present a holistic approach to playing the instrument with perspectives involving body, mind, and spirit. It consists of short bite-sized lessons including a 30-minute yoga class. There are lots of great tips and advice to try, and on more than one occasion I found myself pressing the pause button and reaching for my flute. I particularly enjoyed a section where Amy demonstrated and gave advice on how to approach the standard daily exercises by Taffanel and Gaubert, and others. This was a very helpful inclusion. 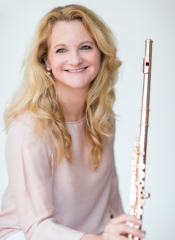 Laura Dwyer, a Certified Yoga Instructor as well as a professional flautist gives a 30-minute yoga class which has been specifically tailored to benefit the flautist. It is evident that a lot of thought has gone into this class, and when you try playing your flute afterwards, you will be pleasantly surprised with the outcome. The DVD also has extremely helpful insights into breathing, and it is evident that these have been well researched. At the BFS Convention in August 2012, Amy give a beautiful recital and it was lovely to have the opportunity to hear her play again on DVD. All levels of players will benefit from the tips and advice offered by Amy and her colleagues in this workshop, but it will be of particular benefit to intermediate and advanced students.